This heirloom quality house is built of quality baltic birch plywood and features a finished exterior with asphalt look shingles. No MDF in this model! The lovely wraparound porch lends itself to many decorating possibilities. Can't you just see the Christmas garlands and wicker furniture? The house measures 37" W x 23 1/2" H x 16"D including the porch. 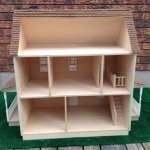 Due to the weight of this house, please contact us for shipping possibilities. 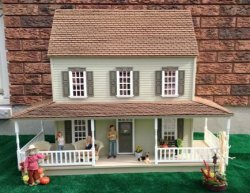 The windows and door have not been glued into place to allow easier interior decorating Lots of play value in this house for any age to enjoy. Acessories sold separately.